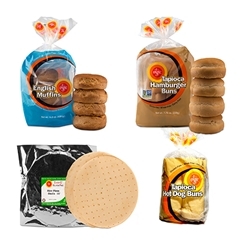 Hamburger Buns: Filtered Water, Rice Flour, Tapioca Starch, High Oleic Safflower or Sunflower Oil, Pear Juice Concentrate, Bamboo Fiber, Yeast, Methylcellulose, Tapioca Syrup, Guar Gum, Organic Palm Fruit Oil, Salt, Orange Citrus Fiber, Calcium Phosphate, Glucono Delta Lactone (from rice). 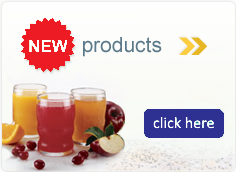 Enriched with Thiamin (Vitamin B1), Riboflavin (Vitamin B2), Niacin, Iron and Folic Acid. Hot Dog Buns: Filtered Water, Rice Flour, Tapioca Starch, High Oleic Safflower or Sunflower Oil, Pear Juice Concentrate, Bamboo Fiber, Yeast, Methylcellulose, Tapioca Syrup, Guar Gum, Organic Palm Fruit Oil, Salt, Orange Citrus Fiber, Calcium Phosphate, Glucono Delta Lactone (from rice). Enriched with Thiamin (Vitamin B1), Riboflavin (Vitamin B2), Niacin, Iron and Folic Acid. English Muffins: Filtered Water, Rice Flour, Tapioca Flour, Apple Sauce, High Oleic Safflower Oil, Sweet Rice Flour, Pear Juice Concentrate, Acacia Gum, Xanthan Gum, Yeast, Egg Replacer [(tapioca flour, potato starch, leavening ( calcium lactate, calcium carbonate, glucono delta lactone), sodium carboxymethylcellulose, methylcellulose)], Sunflower Lecithin, Orange Citrus Fiber, Salt, Glucono Delta Lactone, Monocalcium Phosphate. Pizza Crusts: Filtered Water, Rice Flour, Tapioca Starch, High Oleic Safflower Oil, Pear Juice Concentrate, Bamboo Fiber, Yeast, Methylcellulose, Salt, Guar Gum, Orange Citrus Fiber, Calcium Phosphate, Baking Powder (Glucono Delta Lactone & Calcium Carbonate). Enriched with Thiamine (Vitamin B1), Riboflavin (Vitamin B2), Niacin, Iron, Folic Acid & Vitamin D.